The records keep on rolling in Glasgow, as British breaststroking ace Adam Peatydemolished a new world record in the 100m distance tonight. 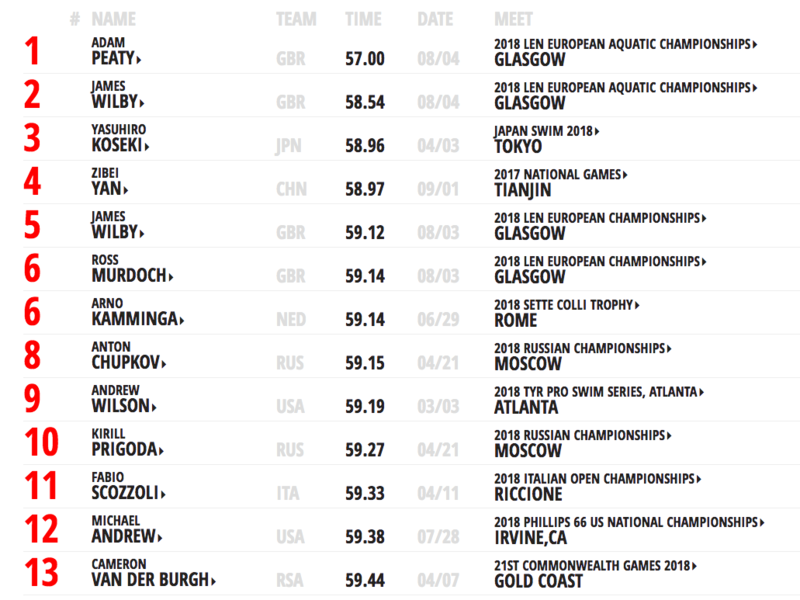 After already notching a championship record in yesterday’s prelim, clocking 57.89, Peaty continued to lead the pack in last night’s semi-finals with a slightly slower 58.04. Tonight, however, the 23-year-old Olympic gold medalist produced an eye-popping mark of 57.00 to once again establish the fastest 100m breaststroke time in history. Launching off the blocks with a .47 reaction time, for once, the fastest of the field, Peaty opened in an impressive 26.65 and closed in 30.35 to produce the 57.00 time, a mark just .01 shy of his own personal goal of ‘Project 56’. His time tonight rips .13 off of his previous World Record of 57.13 set en route to the top of the podium in Rio at the 2016 Olympic Games. Peaty now owns the 14 fastest performances ever in this 100m breaststroke race. We’ll see what he is able to do in the 50m breast on August 7th. Teammate James Wilby also scored a new personal best in the race, stopping the clock at 58.54 to mark his first time ever under the 59-second threshold. He now sits behind Peaty as the 2nd fastest swimmer in the world this season.